White dwarfs forming in extreme magnetic fields could be stabilized, allowing them to get bigger before they explode, leading to a brighter bang when they finally do, according to a team of researchers in India. 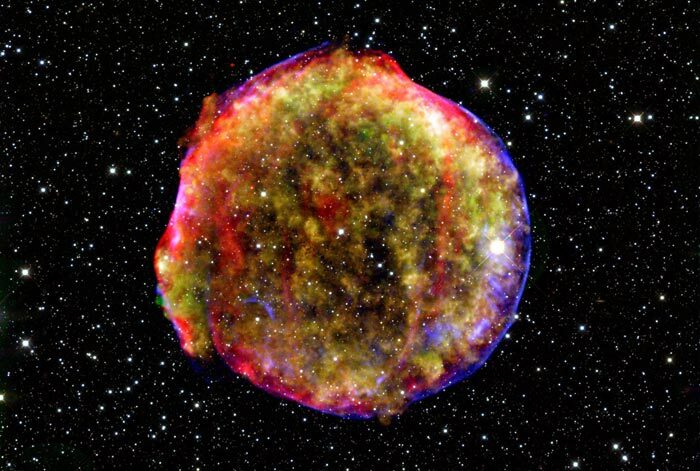 Type Ia supernovae, caused by exploding white dwarfs, are often used by astronomers as "standard candles" to calculate the distance to a point in space because they are extremely bright and usually have similar luminosity. But some anomalously bright type Ia supernovae that scientists could not explain have been observed recently and the new work could provide an explanation for them. A white dwarf is a star that has used all its hydrogen and helium and is too cool to burn carbon. It has therefore collapsed into a highly dense state. With no source of energy, it glows only because of residual heat, and over billions of years it will cool down and become a black dwarf, if it is left undisturbed. In 1935 the Indian astrophysicist Subrahmanyan Chandrasekhar famously showed that a star would not form a white dwarf if its mass was greater than 1.44 solar masses because the core temperature would be sufficient to ignite carbon fusion. If a star's mass increased beyond this "Chandrasekhar limit" of 1.44 solar masses after it has collapsed to form a white dwarf, the star shrinks still further. The loss in gravitational potential energy causes an increase in temperature, and a runaway fusion process begins, creating a massive thermonuclear explosion that obliterates the star in seconds. Because type Ia supernovae are almost always formed by the thermonuclear explosion of an object with about the same mass, they almost always have about the same brightness. Observations of distant type Ia supernovae proved the expansion of the universe was accelerating, a discovery rewarded with the 2011 Nobel Prize for Physics. However, there have been a small number of troubling observations recently of nearby type Ia supernovae that are abnormally bright, and which appear to have been formed by the detonation of a white dwarf well above the Chandrasekhar limit. The absence of a satisfactory model for how these could be produced has placed a question mark over the use of type Ia supernovae as standard candles for observing distant galaxies. In the new research, Upasana Das and Banibrata Mukhopadhyay of the Indian Institute of Science in Bangalore suggest that these "super-Chandrasekhar" white dwarfs might occur in very high magnetic fields. Such fields, they reason, could stabilize a white dwarf of mass up to 2.58 solar masses by a process known as Landau quantization. This would increase the stellar remnant's resistance to gravitational collapse, allowing it to continue accreting mass until it reached a higher limit. At this point it would detonate with an even bigger bang than would otherwise have been possible. But how might such a field be generated? Das and colleagues point out that magnetic fields of 107–108 G can be detected in about 25% of accreting white dwarfs. If such a star collapses, the magnetic flux is conserved, while the radius is reduced dramatically. The magnetic fields therefore become orders of magnitude stronger. Mukhodpadhyay now believes that the team needs to focus on observing a larger sample of highly magnetized white dwarfs in the hope of observing this spike in field as one collapses. "You start with an observed white dwarf of field 109 G," says Mukhopadhyay, "Later on, it should pass through an intermediate phase when the field increases to 1011 G – those we have not seen yet." He cautions, however, that an increase in field might not be detectable if the matter accreting onto the white dwarf caused magnetic shielding. Mukhopadhyay believes that it is too early to say whether the model has any direct implications for the expansion rate of the universe. He does, however, tell physicsworld.com that "the existence of super-Chandrasekhar white dwarfs is a major paradigm shift in our understanding of white dwarfs and several of the related results may have to be examined in this light". Jeffrey Silverman, an astrophysicist at the University of Texas at Austin, says the paper presents "a pretty impressive increase in the maximum white dwarf mass which, as they point out, matches some of these recent observations – or at least gets closer to them". He is more sceptical, however, about the researchers' claims of a paradigm shift: "We've seen very few of these super-Chandrasekhar objects. They're very rare, they're pretty distinguishable from more typical type Ia supernovae that we use for cosmology. It's highly unlikely that our calculations of the history of the universe would have many – if any – of these objects contaminating them." The research in published in Physical Review Letters.